The highly anticipated second series of the Dair Ghaelach range to come from Midleton Distillery - the new Dair Ghaelach Bluebell Forest series. This exceptional whiskey is comprised of Single Pot Still distillates aged between 12-23 years that have been matured primarily in American oak Bourbon barrels, before being finished in native virgin Irish oak casks harvested from Bluebell Forest, Castle Blunden Estate, Co.Kilkenny. Uniquely each bottle can be traced back to one of six individual 130 year old oak trees that were carefully felled in the Bluebell Forest in May 2013. This whiskey undoubetly has the perfect balance between spicy single pot still Irish whiskey and Irish oak characteristics! This bottle contains whiskey which was matured in tree number 4. Taste The typical Pot Still spices are fortified by the Irish oak character. Robust yet mellow, clove and cinnamon give away to dairy fudge and milk chocolate sweetness combining with a touch of stewed apple. Nose The crisp Pot Still spices are seamlessly enriched by the woodland fragrances of the Irish oak. Sweet vanilla notes are given depth by some chocolate honeycomb and coffee beans, whilst the balancing rich fruit aromas of red berries, pineapple and ripe banana complement the subtle aromatic oils. Finish Exceptionally long with soft sweet spices finally giving way to the proud Irish oak. 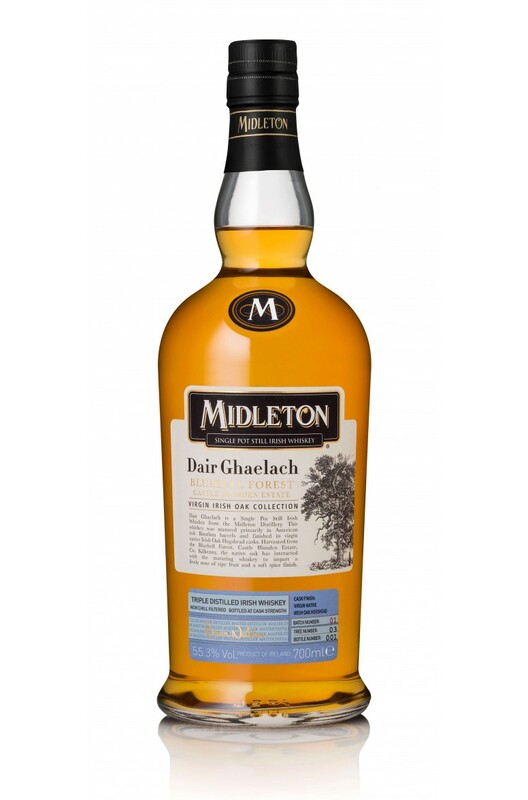 The highly anticipated second series of the Dair Ghaelach range to come from Midleton Distillery - t..